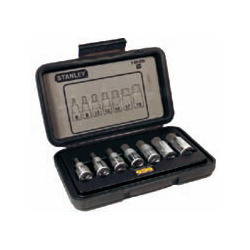 We provide high quality and durable 7 Piece 1/2 Drive Hex Bit Metric Socket Sets. Creating new benchmarks in the industry as a leading organization, we are involved in offering Hex Bit to our valuable patrons. Convert a hammer blow into a high torque screwing action. Hex drive nose pieces can be removed to allow use with 1/2. A fantastic impact driver that uses a bit adapter, allowing you to install ½ impact sockets. Hex Bit sockets made up of Chrome Vanadium Steel Heat Treated to withstand required Torue. Used to drive mostly socket head screws. Description 1/4" hex-to-1/4" square adaptor features a hex insert and ball-detent end that can be used with small 1/4"sockets. Allows ratcheting screwdrivers to be used as ratcheting nutdrivers. Tulex Industrial Tools Pvt. Ltd.
Shree Assembly Tools Pvt. Ltd. is one stop shop of 1/4" Hex Insert Bits Drive manufacturer which include various types of specifications.